A new commandment I give to you, that you may love one another, just as I have loved you, so you may love one another. By this all shall know that you are my disciples, if you have love for one another. It’s pretty common for people to think of Christianity or religion in general about merely commandments. We Christians haven’t helped that misconception by insisting that the Ten Commandments be posted in every public place we can get our hands on. And we don’t foster a genuine understanding of the meaning of Jesus when we rail on and on about the particulars of wrong and right, placing much more misplaced concern on the former than the latter. It isn’t any wonder to me that so many people who want nothing to do with Christianity think of it as a broken and inadequate moral system, and that they even explain away its existence in the first place by asserting that some ancient people just needed a system of do’s and don’ts to get people to act good. It’s a terrible argument against Christianity, but with the way the church acts sometimes it’s hard to come down too hard with the blame on those who make it. I said at the beginning of this post that on that Thursday two millennia ago, Jesus decided to share what he thought was the most important thing it was for him to do, not to say, even though “Maundy” Thursday is all about the commandment that he says to them, right? 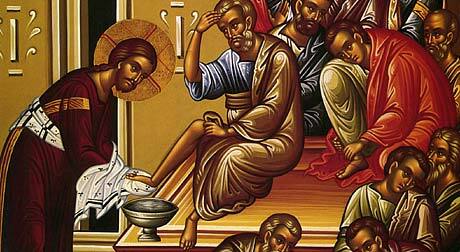 I differentiate between the doing and the saying here because Jesus–the one who is when Abraham was, the way, the truth, and the life–has just washed his own disciples feet prior to telling them that they are to now love one another as they have loved him. And this act of love, the sharing of it and the demonstration of it, is really the closest that we can come to a “commandment” to love. I wouldn’t be surprised if Jesus said “a new commandment” somewhat tongue-in-cheek, knowing that love cannot be commanded or forced in any way, and would the next day show the world that what life and law is all about is loving the Lord your God with all your heart, being, mind, and strength and loving your neighbor as yourself. There may be nothing more valuable to remember these days than that this is how Jesus–like the prophet he was (cf. Micah 6:8), and like a number of fellow Jews did during his time–summed up what the Lord expects of us. Which is not, for example, making sure I am going to heaven. And it’s not living by the rulebook. And it’s certainly not making sure others are living by the rulebook (Matthew 7:3-5). It is taking up the cross and living through his death into his resurrection. Loving others because we are loved, putting others first as Jesus put others before himself (Mark 10:45; Philippians 2:3-8).